In the beginning God not only created the world, but He established an order by which it would run smoothly. Each part or entity was distinctly defined and each given its own unique rule. This is true in each domain - the physical, the plant, the animal, and the human. It is with the latter that this booklet is concerned. The Scriptures teach that God in His wisdom chose to divide the human domain, as He did some of the others, into male and female segments. Likewise the Scriptures set forth the order: namely, that man was created first and the woman was then created to be his helper. 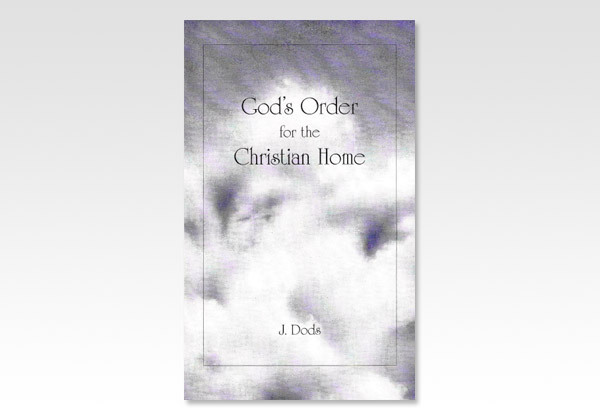 God's order never changes. James, an early servant of God, was inspired to write, "The Father of lights, with whom is no variableness, neither shadow of turning. James 1:17. Here we have divine authority for maintaining an order exactly as God set it up. The writer does not expect the contents of this pamphlet to win the approval of non-Christians. One of the earliest recorded characteristics of the human nature is the tendency to corruption (see Genesis 6:11,12). It is, therefore, consistent with the nature of unregenerate men and women that the order which God established should be corrupted. Not to our surprise, men and women are denying the distinctions that God has made between them and are simultaneously defining roles for themselves which God never gave to them. The writer does pray that this booklet may be used in blessing to believers in the Lord Jesus Christ. For though we have new birth, a nature that responds to God's order, we have within us the old nature that still has all the tendencies it had before our conversion. In addition, we live in a non-Christian atmosphere. The corrupted practices of this environment defile us and influence our thinking. For this reason Paul warned us, "Be not conformed to this world: but be ye transformed by the renewing of your mind, that ye may prove what is that good, and acceptable, and perfect will of God." Romans 12:2. If we wish for anything less than "that good, and acceptable, and perfect will of God" in the matter of male-female order, surely we are being conformed to the world. If we continue to ignore God's direction and order, this will lead us to be part of the corrupted order that this world is establishing. In the beginning God established an order that He could bless: "Male and female created He them; and blessed them." Genesis 5:2. How sad to deny ourselves and our families this blessing. The subject is approached with considerable trepidation. It is not so much the fear of going against the current of modern thought that gives apprehension, but rather the dread of polarizing and dividing Christians by the mention of the subject. Our fellowship and basis for worshiping together are founded on simple but marvelous truths relative to the person and work of our Lord Jesus Christ. Yet it is only too often that division occurs and true fellowship is broken by disagreement on much less fundamental issues. Surely if our wish is simply to comply with His will rather than to support our own traditions or current lifestyles, we can benefit from an examination of what the Scriptures say concerning the role of the man and the woman in God's order for the Christian family.